It’s very important that you check your car’s battery as frequently as possible. That way you will be well placed to prevent it from corroding or weakening. Otherwise, it may die on you at the most inopportune moment. 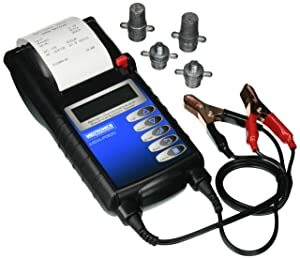 With a Midtronics battery tester, you can check for things like the battery’s Cold Cranking Amps (CCA), load, current temperature, voltage and many more. Provided you pick the best Midtronics battery tester, you can run multiple tests and get plenty of information that can help you maintain your battery and car. Well, ‘best’ is relative. Whatever works for you might not be suitable for the next person. That’s why we’ve put together a list of 5 of the best Midtronics battery testers. Buckle up and let’s down to the review, shall we? 3.1 1. Where are Midtronics battery testers made? 3.2 2. 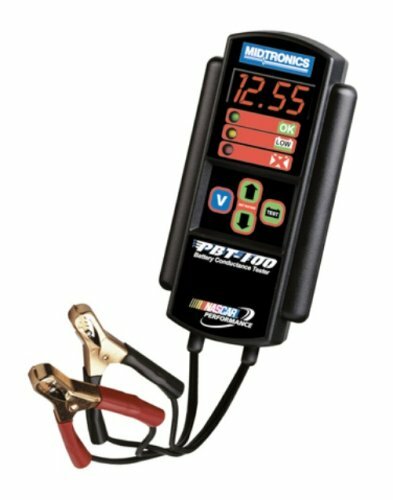 Can I use a Midtronics battery tester to test the car starter and charging system? 3.3 3. Why is the CAA rating of my battery important? 3.4 4. How often should I check my battery’s CCA? 3.5 5. Can I use a 12V tester on a 24V battery? 3.6 6. Where can I buy a Midtronics battery tester? 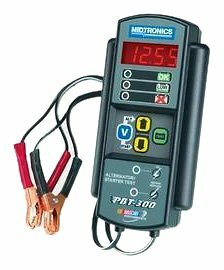 Midtronics PBT300 is the best Midtronics battery tester on the market. Midtronics MPPBT100 is designed for use with OEM as well as aftermarket batteries. In other words, it can test pretty much every battery out there. Why Taking Midtronics MPPBT100 Digital Battery Tester? To kick the review off is the Midtronics MPPBT100. With an operating range of 350 to 850 CCA, this battery tester is simple enough to be used by the ordinary car owner. It can measure batteries in the range of 8 to 17 volts. That makes it suitable for most cars and light trucks. And according to Midtronics, the tester is designed for use with OEM as well as aftermarket batteries. In other words, it can test pretty much every battery out there. The one thing that might make the MPPBT100 the best Midtronics battery tester is its simplicity. After hooking the clamps, simply input the CCA of the battery you want to test. Press Enter and the tester will give you a green light if the battery is okay. If you get a yellow light then it means you need to replace the car battery soon. A red light indicates a defective battery. With that information, you will know whether you’ve been struggling to charge a junk battery or if your car needs jump starting. Another reason why this unit might pass as the best Midtronics battery analyzer is that it features a voltmeter mode. When in that mode you can use the device to test the starter as well as a charging system. That’s important because if your car isn’t starting you need to know if the problem is, in fact, the battery or perhaps car starter. To kick the review off is the Midtronics MPPBT100. With an operating range of 350 to 850 CCA, this battery tester is simple enough to be used by the ordinary car owner. The voltage range of 8 to 17V means you can’t use the tester on some vehicles like heavy trucks and 6V golf car batteries. What can Midtronics MPPBT100 Digital Battery Tester be used for? The simplicity, low price tag, and accuracy of the Midtronics MPPBT100 make it suitable for the ordinary car owner. The Midtronics PBT100KIT has an operating range of 350 to 850 CCA and can measure batteries in the range of 8 to 17 volts. Why Taking Midtronics PBT100KIT Digital Battery Analyzer? The Midtronics PBT100KIT is the same exact battery tester as the MPPBT100. It has an operating range of 350 to 850 CCA and can measure batteries in the range of 8 to 17 volts. The only difference between the two products is that this one comes as a kit that includes a set of lead stud adapters and vinyl case. One problem with the MPPBT100 (first product) is that it doesn’t come with a case. That might prove to be a significant problem if you are a very mobile person, especially if you don’t have a dedicated toolbox. In any case, putting your Midtronics PBT100 tester in a toolbox isn’t the best idea because it might get knocked about by other tools. The vinyl case included in the Midtronics PBT100KIT solves that problem. For most users, the set of lead stud adapters is perhaps what makes this unit the best Midtronics battery tester. They will come in handy when you need to test and charge the side terminals as well as top post threaded battery. Not compatible with heavy trucks and 6V golf car batteries. What can Midtronics PBT100KIT Digital Battery Analyzer be used for? Since it’s the same exact product as the Midtronics MPPBT100, this particular unit is most suitable for car owners. Midtronics PBT300 has a wider measurement range of 100 CCA all through 1400 CCA. That’s a huge step up from the 350 to 850 CCA offered by the MPPBT100. Why Taking Midtronics PBT300 Battery Tester? The Midtronics PBT300 has a higher price tag than the MPPBT100 for a reason. First off, it has a wider measurement range of 100 CCA all through 1400 CCA. That’s a huge step up from the 350 to 850 CCA offered by the MPPBT100. And you may need the expanded range to cover the oldest and newest batteries that typically have extreme CCA readings. Designed for 12V batteries, this Midtronics digital battery analyzer does a great job when giving results. In addition to a digital display, it features a green, yellow and red LED for fast decisions. If the red LED comes on it means you’re dealing with a junk battery. Conversely, a green LED indicates a healthy battery while a yellow LED means that the battery may die soon. That’s a good way of knowing whether you should even consider charging the battery or simply dispose of it. More impressively, the Midtronics PBT300 supports various tests. Top on the list is bad cell detection. The analyzer will tell you whether your car battery has a dead cell or not. Additionally, the device checks both the starter system and charging system. If you want to know whether your car’s starter system is faulty simply press the down arrow on the tester. To diagnose the charging system use the up arrow. That wide range of tests is what might make this unit the best Midtronics battery tester. In addition to a digital display, it features a green, yellow and red LED for fast decisions. If the red LED comes on it means you’re dealing with a junk battery. What can Midtronics PBT300 Battery Tester be used for? This Midtronics digital battery analyzer is ideal for DIYers and enthusiasts who frequently work on 12V car batteries. It’s a fairly wide range of measurement means you can check various batteries for their CCAs. In addition to CCA, Midtronics MDX-P300 supports multiple ratings, including CA, DIN, EN, IEC, JIS, and MCA. To top it off, you can perform AGM, GEL and lead-acid tests with it. Why Taking Midtronics MDX-P300 Electrical System Battery Tester with Printer? Up until this point we’ve only looked at Midtronics digital battery analyzers that offer the most basic functions. How about we take that a notch higher, and coming in handy is the Midtronics MDX-P300. With the ability to test batteries from 100 CCA to 1400 CCA, this unit features a 1.2-meter cable. That should be long enough to give you plenty of mobility as you take readings. It tests 12V batteries, which means you can use it on pretty much every car and light truck. In addition to CCA, this device supports multiple ratings, including CA, DIN, EN, IEC, JIS, and MCA. To top it off, you can perform AGM, GEL and lead-acid tests with it. Plus it can detect bad cells and test discharged batteries (up to 1 volt) while offering reverse polarity protection. That versatility and a wide range of functions are what make it arguably the best Midtronics battery tester on the market. Away from functionality, the MDX-P300 features a built-in printer that provides a printout of test results. You can customize the header of the printout however you want. That should be a handy feature for garages and auto shops that need their brand name on the printout. With the ability to test batteries from 100 CCA to 1400 CCA, this unit features a 1.2-meter cable. What can Midtronics MDX-P300 Electrical System Battery Tester with Printer be used for? This unit is undoubtedly the best Midtronics battery tester with printer. It’s ideal for use by professionals in auto shops and garages. You can perform a test and review the printout with your customer. Midtronics MDX-640 allows you to test various types of batteries. They include regular flooded, AGM flat and AGM spiral. Why Taking Midtronics MDX-640 Battery Analyzer? The Midtronics MDX-640 may be a premium battery analyzer but it’s incredibly simple to use. Once you hook it up to the battery it immediately gives you the voltage reading. Note that the unit is meant to test 6V and 12V batteries only. Press Enter to continue, and the tester will ask you to choose the type of battery you want to analyze. It’s a multi-application device, so your options include automotive, motorcycle, marine vehicles, lawn and garden vehicles, commercial 4D & 8D batteries, and Group 31 batteries. If you are a car owner or mechanic then you would be more interested in testing automotive batteries. In that case, the Midtronics MDX-640 allows you to test various types of batteries. They include regular flooded, AGM flat and AGM spiral. The CCA rating is the most important in the US. That’s why the MDX-640 lists it first among the ratings. But besides that, you can also use CA, DIN, EN, IEC, JIS and MCA ratings. Circling back to CCA, the MDX-640 can test batteries from 100 to 1400 CCA. In sum, this Midtronics digital battery analyzer is the most versatile, covers the most types of batteries and supports almost all ratings. And it’s super-fast in retrieving test results. You would be absolutely right to call it the best Midtronics battery tester on the market right now. It’s a multi-application device, so your options include automotive, motorcycle, marine vehicles, lawn and garden vehicles, commercial 4D & 8D batteries, and Group 31 batteries. What can Midtronics MDX-640 Battery Analyzer be used for? 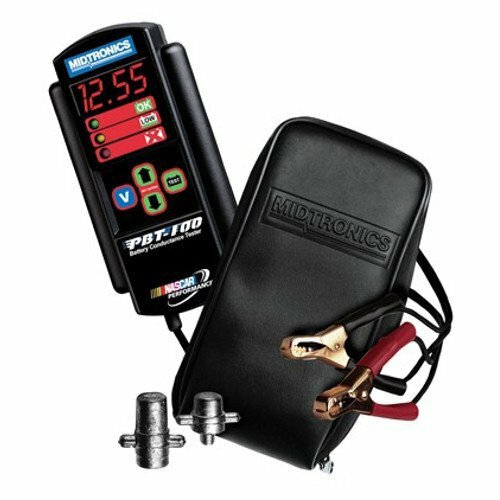 Even with the few drawbacks, the Midtronics MDX-640 makes a great addition to any auto shop or garage. It is perfect for professionals who frequently have to test batteries that are in the 6V to 12V range. 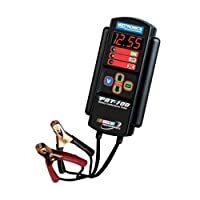 Bottom line Midtronics PBT300 digital battery analyzer is ideal for DIYers and enthusiasts who frequently work on 12V car batteries. Midtronics MDX-P300 is ideal for use by professionals in auto shops and garages. You can perform a test and review the printout with your customer. Midtronics MPPBT100 it suitable for the ordinary car owner due to its simplicity, low price tag, and accuracy. 1. Where are Midtronics battery testers made? 2. Can I use a Midtronics battery tester to test the car starter and charging system? Yes. All Midtronics battery testers can check CCA, car starter and charging system. 3. Why is the CAA rating of my battery important? It indicates the battery’s ability to start the engine in cold temperatures. It’s particularly important during the cold seasons. 4. How often should I check my battery’s CCA? Check your car battery at least four times per year. If you can do it more times then that would be great. 5. Can I use a 12V tester on a 24V battery? No. You will need a 24V tester to analyze a 24V battery. 6. Where can I buy a Midtronics battery tester? Follow the links provided on each Midtronics product above. You will get the best deals on genuine Midtronics battery testers.